Our event is Saturday, July 21 and here are a few details about the venue, food and more to help make the whole thing run as smoothly as possible. Our event is Saturday, July 21 and here are a few details about the venue, food and more to help make the whole thing run as smoothly as possible. For questions about who's organizing the event and why, see our launch FAQs from way back. 86 Miller Street near St. Keele and St. Clair Ave West. Via bicycle: Coming from the south, the railpath is a great way to reach the venue by bicycle or on foot. Via public transit: The St. Clair Ave streetcar makes frequent trips. Disembark at Old Weston Road and head south on Ford Street. It's a 7-minute walk from St. Clair Ave.
No! Save a tree. We'll just check your name off the list. Doors open at 8:30 a.m. for a light breakfast and coffee. The first speaker starts at 9:30 a.m.
We’ll have coffee, tea, orange juice, muffins, bananas, apples and croissants. Lunch is not included in the ticket price. Our friends at Peas & Thank You will be selling their vegan cuisine on-site. Prices are about $8 per item. 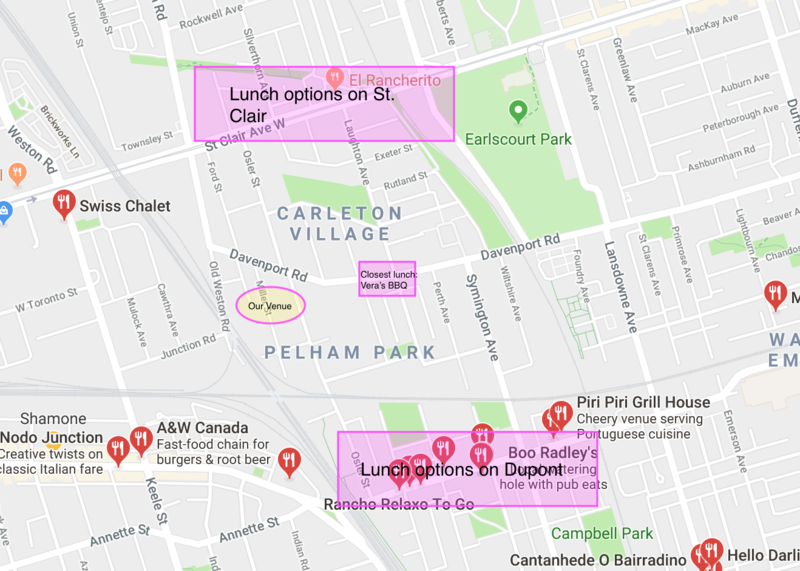 There are also many nearby food options in the neighbourhood. Yes. We’ll accept cash or email money transfer. Yes! Login details will be discussed in the morning address.